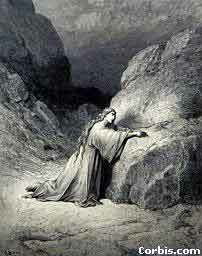 Almighty God, whose blessed Son restored Mary Magdalene to health of body and mind, and called her to be a witness of his resurrection: Mercifully grant that by thy grace we may be healed of all our infirmities and know thee in the power of his endless life; who with thee and the Holy Spirit liveth and reigneth, one God, now and for ever. Mary Magdalene is mentioned in the Gospels as being among the women of Galilee who followed Jesus and His disciples, and who was present at His Crucifixion and Burial, and who went to the tomb on Easter Sunday to annoint His body. 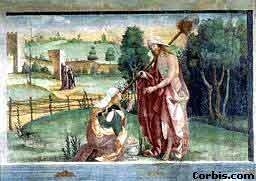 She was the first to see the Risen Lord, and to announce His Resurrection to the apostles. Accordingly, she is referred to in early Christian writings as "the apostle to the apostles." Mary Magdalene, Mary of Bethany (sister of Martha and Lazarus), and the unnamed penitent woman who annointed Jesus's feet (Luke 7:36-48) are sometimes supposed to be the same woman. From this, plus the statement that Jesus had cast seven demons out of her (Luke 8:2), has risen the tradition that she had been a prostitute before she met Jesus. Because of the assumption that Mary Magdalene had been a spectacular sinner, and also perhaps because she is described as weeping at the tomb of Jesus on the Resurrection morning, she is often portrayed in art as weeping, or with eyes red from having wept. From this appearance we derive the English word "maudlin", meaning "effusively or tearfully sentimental." There is a Magdalen College at Oxford, and a Magdalene College at Cambridge (different spelling), both pronounced "Maudlin." ... the idea that the woman caught in adultery, the woman who was forgiven much because she loved much, the woman with the expensive perfume who bathed Jesus' feet with her tears and hair, were all Mary Magdalene. I don't know whether there is any firm evidence that this is true or whether this was spoken of in early writings. (Penguin Books, London, 2nd ed, 1983) under "Mary Magdalene": among other women [besides Mary Magdalene] mentioned in the gospels are the unnamed woman "who was a sinner" (Luke 7:37-50), and Mary of Bethany, Martha's sister (Luke 10:38-42). These are not further identified, and in Eastern tradition they are usually treated as three different persons. But the West, following St. Gregory the Great [540?-604], regarded them as one and the same, though weighty voices from St Ambrose [337?-397] onwards preferred to leave the question undecided. 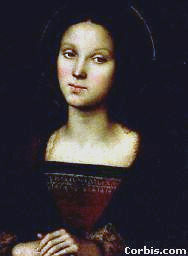 This western tradition resulted in St. Mary Magdalene's being looked on as an outstanding type of the penitent and the contemplative. The eastern tradition has now been adopted in the new Roman calendar (1969). Are (2) and (3) the same? Yes, for each annointed Jesus' feet as He reclined at dinner, and wiped them with her hair, to the scandal of the beholders. No, for the circumstances were quite different, so that it would have to be two different annointings. 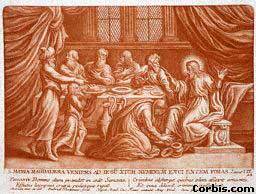 Perhaps, since Mary might at the close of His ministry have seen fit to annoint Him a second time, and to do so in a way that would suggest to them both the former annointing, when He had declared her sins forgiven. Are (1) and (3) the same? Yes, for they are both women who were living in unchastity until Jesus transformed their lives. No, for there is no reason to suppose that the sins of (3) included unchastity, and no reason to suppose that that the "seven demons" driven out of Mary Magdalene were sins of unchastity, or indeed sins at all. The Bible does not speak of the demon-possessed as more sinful than anyone else. Perhaps, for there was then, as now, a regretable tendency to use the terms "immoral" and "unchaste", or "living in sin" and "living in unchastity", interchangeably. A great many minor characters appear briefly in the gospel narratives, "unheralded and unpursued." There is a natural tendency for the imagination to try to tidy things up by identifying some of them, so that (for example) the centurion who at the crucifixion said, "Truly this was the Son of God," is suggested to be the same centurion whose servant was healed at Capernaum. But real life is not always tidy, and these suggestions remain only suggestions. The story of the "woman who was a sinner" (Luke 7:36-50) has been misunderstood by some readers. When Jesus was a dinner guest, a woman who was a "sinner" (sins not specified) came into the room and wept, and kissed and annointed his feet, and the host was shocked. Jesus told a parable: "A man had two debtors, one who owed him 500 denarii, and the other 50. Since they could not pay, he forgave them both. Which will love him more?" The host said: "I suppose, the one whom he forgave more." Jesus said: "Good answer. This woman has been forgiven much, and you see that she loves me much. You have been forgiven little, and you love little." One verse reads: "Her sins, which were many, are forgiven, for she loved much." Some readers take this to mean that her love for Jesus was the cause of his decision to forgive her. Some assume that she was an adulteress, and understand the verse to mean that adultery is okay if you are truly in love. But there is a language problem here. If someone says, "It has been raining, for (or because) the pavement is wet," he does not mean that the wetness of the pavement is the cause of the recent rain. He means that it is evidence of the recent rain. It is the cause of our knowledge of the recent rain. His statement, "It has rained, because the pavement is wet," is shorthand for, "I know that it has rained, because I see that the pavement is wet." So here, as far as our knowledge goes, we see that the woman is grateful to Jesus, and as a result we believe that he has done something great for her (such as forgiving her sins and restoring her to life and joy). But as far as the events are concerned, the restoration comes first and the gratitude follows as a result.